Everyone loves courgette flowers! They are so nice and delicate, and you can use it in several ways: to dress your pasta or as a light side for meat and fish. Have you ever tried them stuffed?? Try this amazing recipe, which is completelly vegetarian! I did bake them in the oven instead frying, so as to have a lighter and more pleasant result. 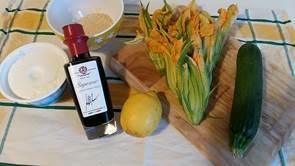 If you want to enhance the flavour even more, just add few drops of Balsamic Vinegar “Saporoso”: aged for six years in barrels of oak wood it is obtained from the juice of the Lambrusco Graspaross, and Trebbiano Modenese grapes. The density is syrupy, and the taste is sour with shades of wild flowers, grass and mustard. For this reason it is delicious, especially with cheese and vegetables, and therefore for this yummy recipe!! 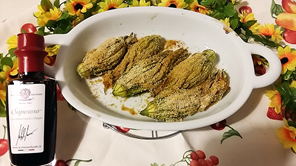 Clean and dry the courgette flowers. Eliminate the inner pistil. 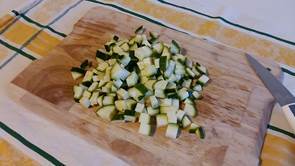 Dice the courgette into tiny cubes. 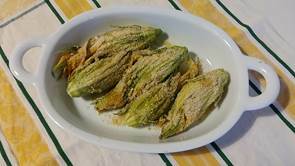 Fry them in a pan with a little bit of Extra Virgin Olive Oil “Il Vero” for few minutes. 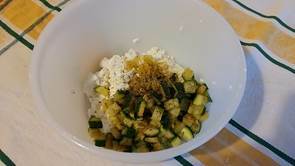 The courgette cubes should remain crunchy. 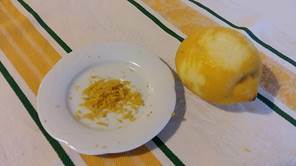 In the meanwhile, grate the zest of the lemon. 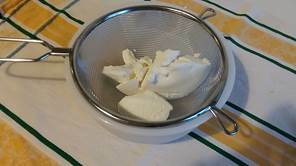 In a bowl, sift the ricotta through a colander. 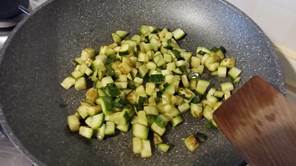 Add a pinch of salt, pepper, the grated zest, and the courgette dices. Stir all together and fill a pastry bag with the ricotta mixture. 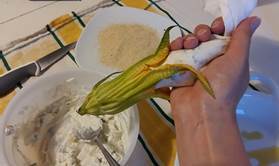 Fill your courgette flowers with the mixture for a half. Otherwise, you can use a teaspoon, but be careful not to broke the flowers. Twist the top of the petals, to close the flowers. 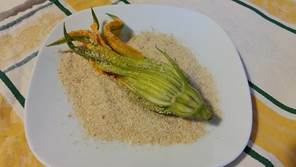 Oil the flower with Extra Virgin Olive Oil “Il Vero” and them cover with breadcrumbs. 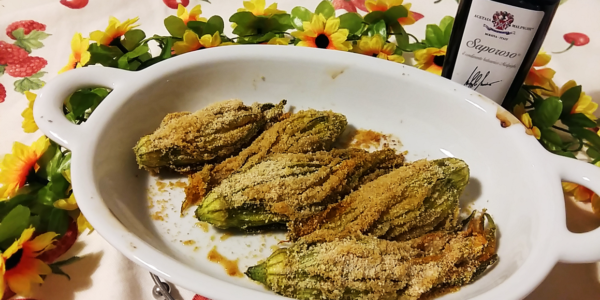 Make the courgette flowers crunchy! Place the flower in a backing tin and bake for 15minutes at 187°C, until brown. Remove the tin from the oven… already done! Sprinkle few drops of Balsamic Vinegar “Saporoso” on top, to make this recipe unique! Add a unique touch with Balsamic Vinegar “Saporoso”!